Marine debris is any persistent solid material that is manufactured or processed and directly or indirectly, intentionally or unintentionally, disposed of or abandoned into the marine environment. Marine debris can come in many forms, including plastics, glass, metal, Styrofoam, rubber, derelict fishing gear, derelict vessels, and so on. 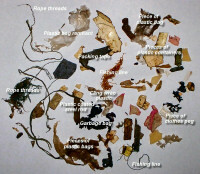 Marine debris can also have significant economic impacts to coastal communities and the fishing industry. 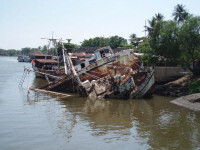 Among a wide host of potential economic impacts are the cost of removal off beaches and reefs and at sea, lost tourism revenues, the cost of repairing boats and ships damaged by marine debris, and the cost to human health. Millions of marine mammals, sea turtles, seabirds, and other animals are sickened, injured, or killed every year by marine debris. Sea turtles can choke or become poisoned when they eat trash, or drown when they become entangled in bags, ropes, and old fishing gear. Many synthetic products, including monofilament fishing line and the nearly ubiquitous plastic shopping bag, take many hundreds of years to break down in the ocean, and may continue to trap and kill animals year after year. Reduce, Reuse, Recycle! 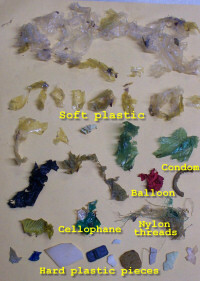 Choose reusable items and use fewer disposable ones. Bring a sturdy, reusable bag with you when you shop – refuse to accept a plastic shopping bag. Dispose of all trash in the proper receptacles. Keep trash cans, dumpsters and recycling bins from overflowing by emptying them regularly; make sure they are covered, secured, and cannot be opened by strong winds or animals. Keep streets, sidewalks, parking lots and storm drains free of trash – they can empty into our oceans and waterways. 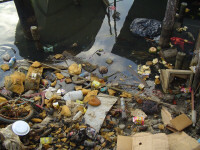 Advocate for regular, sanitary waste disposal from coastal areas. 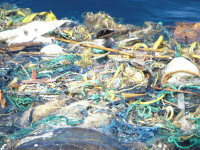 Boaters should properly stow and secure all trash onboard, and report any illegal waste disposal in offshore waters. Never dispose of fishing line or gear at sea – if possible, recycle used fishing line in appropriate containers or at participating locations. Call your local environmental or resource management office to find out what materials can be recycled in your area. Set an example to others – get involved in local clean-ups and encourage others to help keep the beaches and oceans clean.